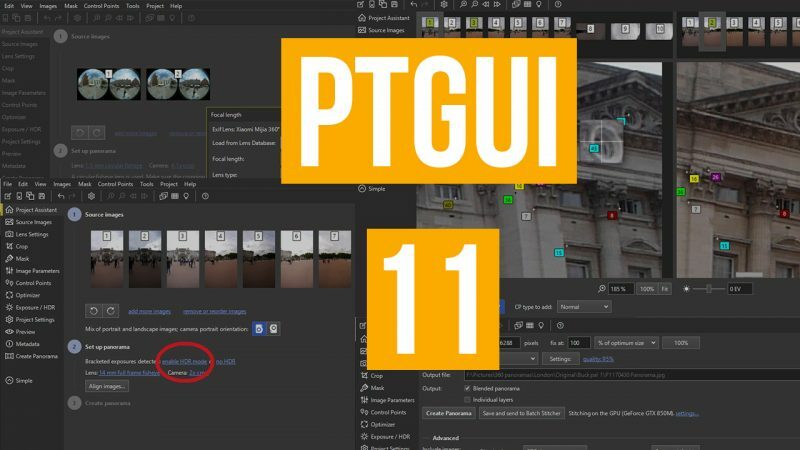 PTGui is one of the most popular programs for stitching 360 photos; I’ve been using it for the past year or so to create virtual tours using a DSLR and panoramic tripod head. This was the only way of creating 360 images before the smaller, cheaper, all-in-one 360 cameras were introduced over the past few years. PTGui 11 represents the biggest upgrade in terms of using interface and functionality that the program has ever seen. Let’s see what the new look PTGui looks like and whether it’s still the number 1 stitching program. There are almost 80 individual changed from PTGui 10 to 11, however none are more instantly noticeable than the interface overhaul. One of my main criticisms of previous versions of PTGui is that the user interface resembled an early 2000’s program, which did give me a lot of confidence when I first started using it. Thankfully the program still worked great, but this new interface improves functionality, makes using the program far simpler and gives it a much more modern look. As I said before, there are nearly 80 changes between PTGui 10 and 11, making it by far the biggest upgrade in the programs history. You can take a look at the full list here, but in this post I’m going to go through some ofmost important changes. When creating 360 panoramas many people choose to shoot bracketed photos, that is 3 identical photos at different exposures. 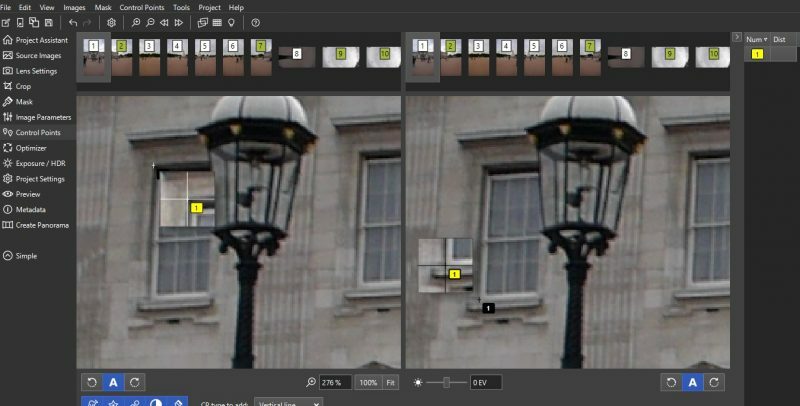 This allows the user to create a HDR effect which often vastly improves the final look of the image. 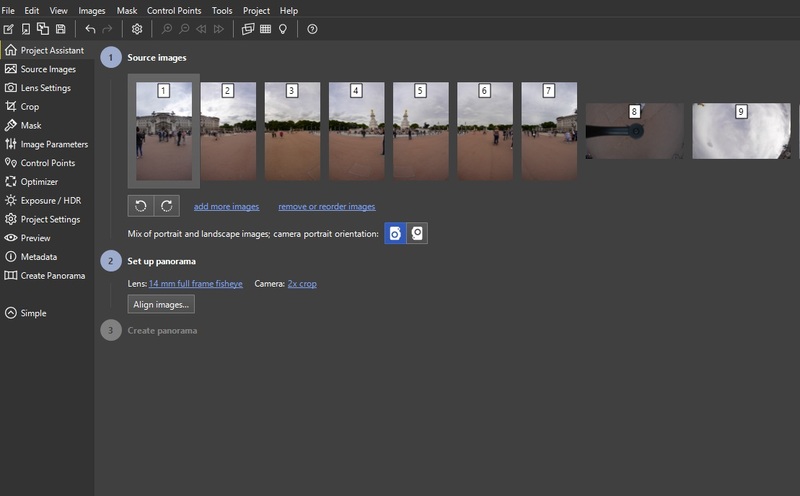 As 360 panoramas can often be made up of 6-8 individual images, times that by three and you have a lot of individual photos on your project panel. PTGui 11 combines all your bracketed photos under a single photo which is automatically created using the three different exposures. This not only clears up your work-space but also allows you to visualize the accuracy of your image quicker than before. You can see the individual exposures by clicking on each image where you can also see exposure settings for each image. If you have a set of bracketed photos that you want to stitch as a HDR in PTGui 11, then here’s how you do it. When your source images are all loaded into the project, click “enable HDR mode”. A box will appear with a few options. Select “Enable HDR Mode” and “True HDR” at the bottom. 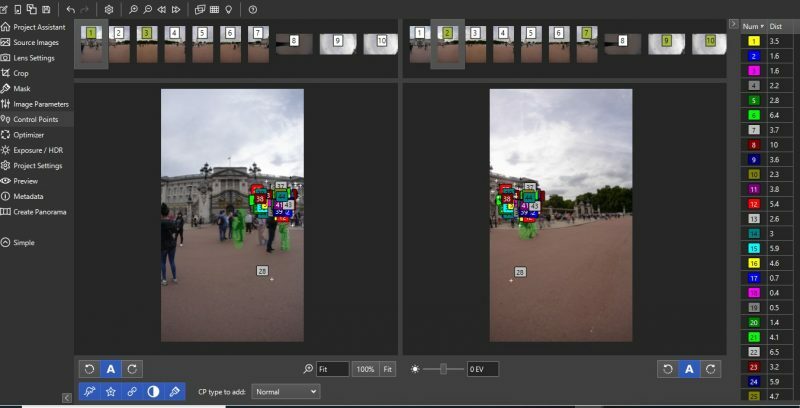 All of your images will then be combined into single HDR images. One of the best new features of PTGui 11 is the massively increased lens database, which allows the program to more accurately detect exactly which lens you used to create your panorama. This is important because it allows PTGui to more accurately stitch the images together if it knows precisely the details of the lens, meaning less manual work for you. This is also the first version of PTGui that’s able to easily detect and stitch duel lens all in one 360 cameras like the Mijia Mi Sphere or Samsung Gear 360. In previous versions of PTGui stitching these images was more difficult as the program had no information on the lenses in its database. Now if you load up an unstitched duel fish eye image, PTGui will be able to create a pretty good stitch automatically. 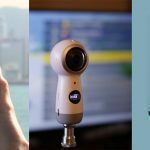 This is one of the best new features of the program and takes advantage of the explosion in cheap, all in one 360 cameras. 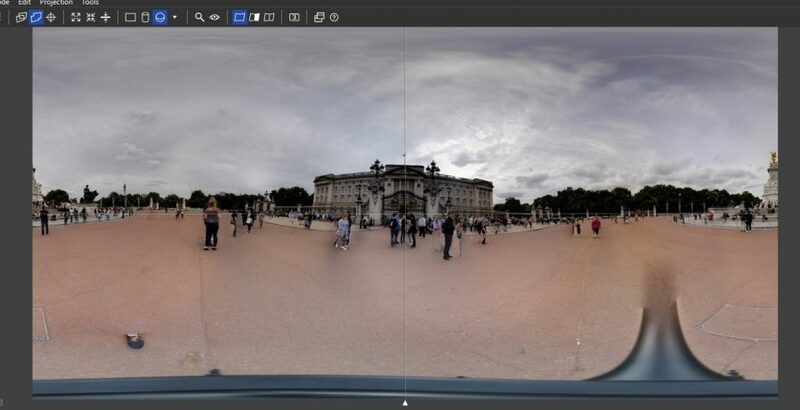 Using PTGui will also allow you to create a much more accurate final 360 panorama than just using a phone app, which is usually how these types of cameras stitch 360 images. Real Time Tone-mapping preview: When PTGui stitches a bracketed HDR image it will now provide a tone mapped live preview. Improved Automatic Stitching & Optimization: PTGui 11 is more likely to get the stitching process right the first time, with less errors and therefore less manual editing required. GPU Acceleration: If you have a dedicated graphics processor in your laptop/desktop then PTGui 11 will be able to take advantage of this and make the software run a lot faster than before. 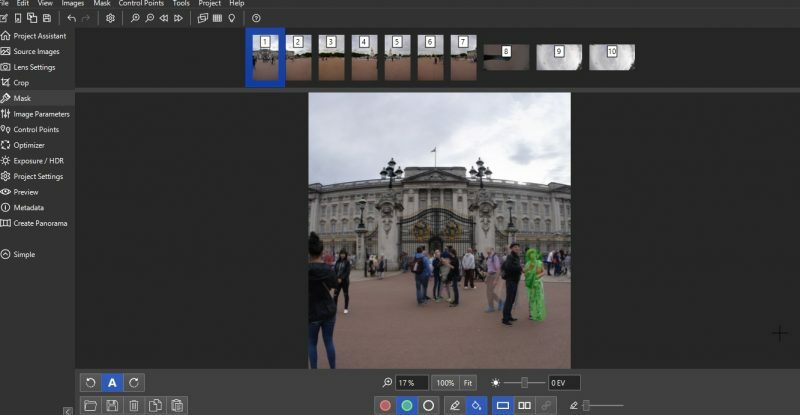 Masking Improvements: You can now mask out unwanted features, such as a tripod on the nadir, even if your image was taken far away from the parallax point. 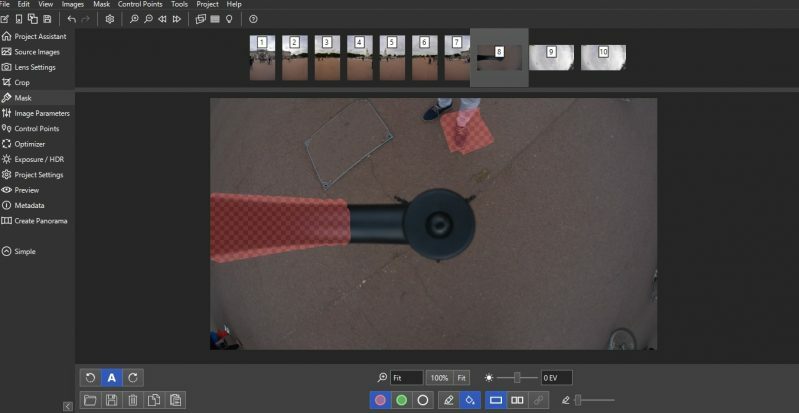 You can do this by selecting the appropriate image and masking out the unwanted features, the program will then be able to produce accurate control points which automatically create a good panorama. See Also: Looking for a 360 Photographer? In this example I shot 30 bracketed images using a DSLR, fish eye lens and panoramic tripod head. The location is just outside Buckingham Palace in London. Usually I would shoot in RAW, convert and edit these in Adobe Lightroom and then load the resulting .TIFF files into PTGui, however for this example I’ll just be using JPGES (the process in the same). First you need to load your images into PTGui. You can just drag and drop them. Then select the HDR option to combine your bracketed images. Click the “allign images” button. This will instruct PTGui to attempt to stitch your image into a single panorama. You may end up with a very good image or one that required some manual work to get right. It should only take a few seconds to finish. This is the resulting image. As you can see the program has stitched the image pretty accurately, but there are some issues. Firstly you can see half a foot where I was standing while shooting the photo (usually I would move out of the way so this wouldn’t happen), and a large part of the tripod is showing. Thankfully PTGui allows us to mask these errors out. As you can see I’ve removed most of the offending features, however I’m not able to completely remove the tripod due to how this was shot. If I wanted to remove the tripod completely I would need to take another shot pointing down by hand, without using the tripoid. This can be covered with a Nadir Logo so it isn’t a huge issue. Control points is how PTGui works out how to stitch your image together. It tried to match overlapping, identical point in each image to ensure a seamless panorama. Most of the time it does this pretty well automatically, but if you resulting image has errors or visible stitching lines you can add or remove control points to increase accuracy. My image actually turned out pretty well and I can’t spot any big stitching errors. There is some ghosting due to the large number of moving people and that is somewhat fixable using masking, however I’m only focusing on this basics in this guide. If you did need to add your own control points to fix stitching errors, here is how you do it. Click on two adjacent image in your panorama and locate an identical point. Click on the point in both image, making sure it is the exact same point. Continue to do this in several locations and then hit optimize to see if your image has improved. Another reason to add your own control points it to straighten your image. This is important as when 360 panoramas are not straight it will effect how they are viewed. In order to straighten your panorama in PTGui select the same image in the control points tab. Once you’ve added your vertical control points go back to the Project Assistance tab and click the optimize button; you should notice an improvement in your final image. Once you are satisfied with your panorama and you are ready to render it, simply go to the “Create Panorama” tab on the left hand side and select your settings. The only setting you might want to change is the file format; if you want to do some more editing to your image after you create it then select either TIFF or .psd (if you want to use photoshop). If you just want to upload your finished panorama immediately, then select keep the file type as JPEG. Click Create Panorama and PTGui will do just that. Depending on the size of your image and the spec of your system this could take just a few seconds or up to a few minutes. Here’s my final image after this whole process is complete. I will say that I created this very quickly just as an example and there is a lot more I could have done both on PTGui and on other programs to make the image a lot more dynamic. Never the less the image has turned out pretty well with few visible seam lines, with the editing process on PTGui taking just a 5 or so minutes. PTGui may look different to its predecessors but the basic functionality is pretty much the same, if streamlined slightly. I’ve noticed a bit improvement in the accuracy of the automatic control points and much fewer stitching errors regardless of what lens/camera I use. A bit plus is the addition of the all in one cameras to the lens database, which makes creating seamless 360 shots even quicker and easier. I would like to see PTGui offer a cheaper subscription alternative for those who want an accurate stitching program for the duel lens cameras but may not be interested in some of the other advanced features. PTGui is still my favorite stitching program, and once you’ve used it a few times it becomes exceptionally quickly and easy to create awesome 360 panoramas. You can read more and buy PTGui 11 on their main website. 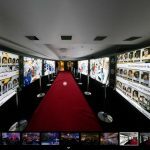 Looking for a 360 Photographer? I'm your man!